Scythe, Accessories, & Expansions: We continually print the following products. They’re available when you see them in stores and on our website. Promo Content: These promos will all be available on Meeplesource for both individuals and retailers (if you want to buy from your retailer, tell them to contact Meeplesource). Ala carte content (miniatures, Automa cards, etc) is available here. These items ship from St. Louis. Digital content, t-shirts, and other merchandise from third-party vendors can be found here. To receive updates about Scythe’s availability, subscribe to our newsletter. Will more plastic containers be produced? Yes, we’re making more, and we’ll sell them in sets of 10. What should i do if i wan the collector’s edition box in canada ??? Yooden: The MSRPs are still accurate even though we don’t sell those products. I’m leaving them there for reference when people buy these products through the secondary market. Have you checked with Board Game Extras in the UK? They’re usually quite good at keeping our promos in stock. Yes, please check out Board Game Extras. When will the next promo be available from BGG? Ryan: Yes, we’re making more, and we’ll be selling them through Top Shelf Gamer in about 3 months. Are the miniatures you can buy in the ala carte page already included in the retail version? Would these just be extras? Yes, they’re extras (mostly for people who want to paint one set). Hi, will you be producing/selling more of the automa decks? Was not able to get any before they sold out. Thanks! Joseph: I’m sorry you missed out, but yes, with every print run we get more replacement parts, so we’ll have more Automa decks in about a month when the next print run of Scythe arrives. Thanks for the quick reply, Jamey. Any way at all to pre-order to avoid missing out again? That’s a good question, but I think we’ll have more than enough, and I don’t want to juggle pre-orders for the next month. :) I’ll announce it on the e-newsletter when they’re available. How far away would you say Promo’s 8, 9 and 10 are? Since I’ll most likely be picking those up alongside the expansion itself if I can. AJ: I would say that they’re all going to be 2017 releases, spread out from each other by 1-2 months. Can I still buy a collectors or art edition? If you can find one. We’re sold out. Desperately after the art book and its only available in Europe. Can i still buy it as I’m in Australia? Hopefully its not an issue. You can place an order, though typically we’re not able to do that because of the shipping expense. If it the shipping fee turns out to be higher than the amount you pay at checkout, I’ll let you know and you can either cancel or make up for the difference. Thanks Jamey. Jumped the gun and placed the order last night. Looked ok during shipping. Let me know if any issues. Yeah, the shipping cost is a bit misleading because it’s calculated based on how much it costs to send you this item if we have it in stock in Australia, which we don’t (hence the description on the item that says “Europe only”). But I’ll see what our fulfillment company in Spain says. Hi, i read this now. I would buy the artbook too, i’m in Europe (Italy). It is dispatched from Spain? Cuz i see only payment in dollars (at ArtStation Shop site, dont know if it was here from the beginning or changed distribution). If its not anymore in Spain, can i buy it anyother way in Europe? The art book is sold out in Europe. Sorry Marco! No problem. Let me know if any changes to shipping. Are the $50 coins only available through Meeplesource or will they be released later some where else? @Patricio: Retailers can order from MeepleSource in bulk, so if you request that your local retailer carry the promos, they can order through MeepleSource. Thanks, I contacted my preferred retailer. They said they are close to a deal that would bring all the Meeple source Scythe stuff to their store! Are you planning a second edition of the Collectors Edition as well or is it finally gone? Is there a possibility to preorder it somewhere? Hi, would you consider putting together & offering something like ‘Invaders from Afar – Collector’s Edition’? Basically ‘Invaders from Afar’ with the new metal coins, and with the new power dials. I’m quite sure that such edition would be popular among your KS backers who chose Premium/Collector’s/Art Connoisseur edition of the base game! Marcin: We’re just making one version of the expansion for everyone. 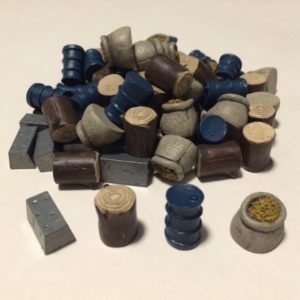 For anyone who wants power dials or metal coins, they can get them through Meeplesource when we release them. Hi! We’re very excited about the reprinting of the game. Where would we actually go (ie., what site) to actually purchase a copy for the prices you listed above? Bronwen: Pretty much every retailer I know is sold out of Scythe, but we’re making more of the retail version, and you should be able to buy it in about a month. You can then add on the various accessories (also via retailers) as they’re released. Great. Will we be able to buy it from this site, or will there be other retailers we should buy it from? Only other retailers. :) If you ask your preferred retailer to carry it for you, I’m sure they’ll do that. Will the Metal Coins and realistic resources be sold in Essen? No, unfortunately the incoming batch won’t be ready by then. Too bad =( Thanks for the fast respond! They’re all gone, Ed, but you can buy a retail version and the various accessories that were in the Art edition in a few months. Hi Jamey, I have mistakenly posted my photo on to scythe’s page if they are still there can you please delete them, since I been deleted on that group. Thanks for letting me know. I thought it was a spam account. :) I’ve added you back to the group (I already deleted the posts). Jamey, is there any chance that the: Promo 8, 9, 10 will be avail in Australia, much like what you did with the regional inventory from the KS? And also, As Promo 8 and 10 are not yet avail for pre-order from MeepleSource, will they be? Also, do you know if the Promo 9 and/or 10 coins will be a limited print run, I’d love to try save on shipping by at least getting an order for all of them at once. Joel: We’re keeping it simple and letting Meeplesource handle the transactions for all promos, but any of them can become regional if you have your local retailer order them in bulk. That applies to any promos, past and future. Nothing will be limited as long as we have demand to make more. awesome thankyou. i think i will have to pick up what is there that didnt already come in the KS and wait for the 2$ coins and extra combat things. Will the premium and collectors edition of Scythe also be available at Essen Spiel 2016? What will the price be in €? Do you plan to sell the metal coins and realistic ressource tokens in Germany also? Or do we have to import them from the US? Kruzada: Yes, in about 2 months retailers in Europe will be able to buy the special accessories from distributors. It will be important for customers like you to tell your retailer that you want those items (so they know to stock them). Hi Jamey, Thanks for your help the other day regarding the Scythe Art Book. Did some digging around and Starlit Citadel have 39 copies in stock if anyone else is interested. Hi Jamey, was in the middle of purchasing Scythe and some extras (Europe) and the realistic resources were available when i was about to buy them but thrb they suddenly sold out while in checkout payment phase so had to go back and remove from my cart, which sucked. When will they be available again in Europe? I’m sorry about that bad timing, Leif. We’re making more, and they’ll be back in stock in a few months–these were just extra items we recently found at our warehouse in Europe. Thanks for the timely reply Jamey! Just an additional thing, these will be available on your shopify store for purchase in Europe correct? So, I’ve been in contact with the few retailers that exist in Sweden (both locally and online stores) and unfortunately they have told me they will only sell the base game and not the accessories. Do you recommend any other options? Leif: Thanks for checking with them. The other option is for you to buy them from Meeplesource. I checked with Meeplesource and they are not currently selling them for pre-order, I contacted them if they would sell the Realistic Resources and was told that they are not sure that they will sell them at all. This is quite disheartening that it is becoming near impossible to locate sales of this in Europe in the future. Leif: I’m sorry for the confusion. The realistic resources aren’t available from Meeplesource; rather, they’ll be available in December from Top Shelf Gamer (or any brick and mortar retailer who orders them from Top Shelf Gamer). I’ve heard nothing but great things about this game.. I can’t wait to pick it up!! Hello Jamey Stegmaier, I have grown found of your game and can’t wait until the retail version is released. However, I Just got a question. It seem like the standard version doesn’t come with the power dial or does it, but does the combat system need the power dial or can you play out the combat system in another way ? Ceasar: Thanks for your question. You only need 2 power dials for combat, and the retail game comes with 2 power dials. Are there any plans to release a Dutch version in Europe? I think there’s a pretty good chance of that happening, as I’ve heard from a Dutch publisher who is interested in it. Is there already more info about the Dutch version? I’m very interested in buying the game after I tried it out, my friends aswell but some of them are not so good in reading English, that’s why… Thanks! Any update about Albion coins? I recently played the game around my friends house and he had the art connoisseur edition. I would really like to buy the collectors edition in Europe (UK) but I am dismayed that you will not be making any more :(. What would I need to purchase in order to essentially have everything that was in the collectors edition? Would I miss out on anything that was kickstarter exclusive? What would the total price be? William: We’re making all of the accessories and promos that go inside of the Collector’s Edition–the answers to your questions are described in detail on this page (just read the page you commented on). We don’t do Kickstarter exclusives. Will the second edition be available for preorder anywhere? And what differences will be in the second edition? Sean: There is no second edition, just reprints of the retail edition. You can pre-order them from any retailer. Any chance we can buy the realistic resources from other place (top shelf gamer only ship to US and Canada) when it becomes available? Top Shelf Gamer is also our distributor for the resources, so your local retailer can order the resources directly from Top Shelf Gamer for you. Also, Top Shelf will be running a pre-order for the resources that will offer friendly shipping to various regions around the world. will the Invaders from Afar also be available in German? If yes, when will that happen? I hope so! But currently there are no plans for that. Can we purchase Scythe and Invaders from Afar from you or only from distributors? And am I right in understanding that Scythe will be available to purchase Oct. 20? Olga: You’ll purchase these items from your retailer of choice (retailers buy from distributors who buy from us). Scythe will be available on October 20, but I would highly recommend trying to reserve your copy from a retailer now, as that batch may already be sold out via pre-orders. We’ll have more available in November. I could not find the larger board, or art book available anywhere. Will they be reprinted? I guess the collectors and art boxes are larger to house all the additional content; I had a look to see if they were but no one knows from my group. Will you be planning a big box option with the expansion (or expansions) for larger meeples, action tokens, metal coins etc? Thank you for keeping the production of promo and upgrade items available. I will get those items and just wait for the dust to settle. Even the retail box is scarce here in Australia. I ordered one and then had my money returned due to “not available” and the prices are over $150 and higher now. Well done on having a local region distributor, I just missed the boat. I usually only bother looking for new games when I am on holiday…which is now. –There’s a detailed answer to this in the main text of this page. –All versions of Scythe have the exact same box size. 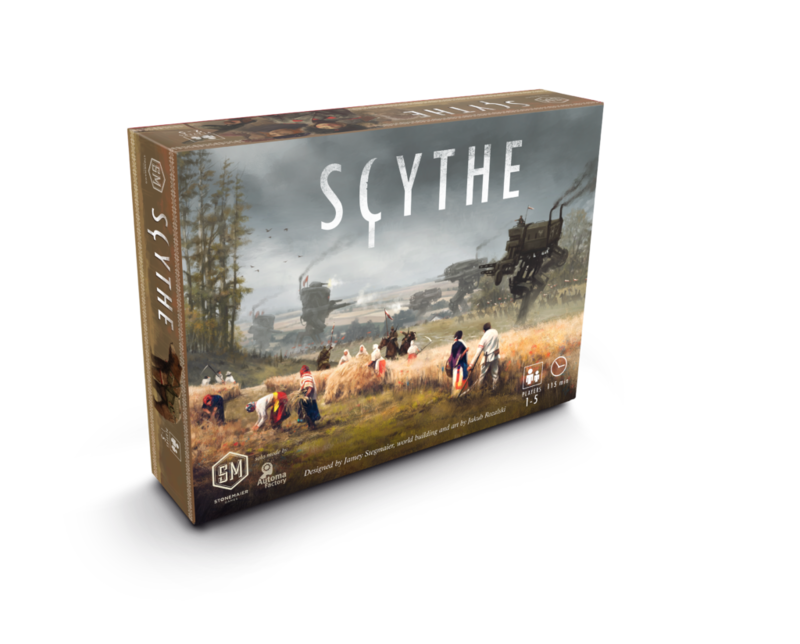 –No, the only version of Scythe we make and sell now is the retail version. The retail box is the same as all the other boxes–it fits everything. Excellent. I will get a set of parts, cards, expansion from Meeplesource and all I need is the base game and still be cheaper than the prices people are charging on collectors editions. Thank you again for allowing late arrivals to your game to get all the extras. will you also sell, the PK packs, metal coins and realistic resources in Essen? Love the game, I will be picking up a copy in Essen. Abe: I hope you have a good time at Essen, but we won’t be there. Morning Players will have their retail copies and promo cards, but no metal coins or realistic resources or extended boards. Hi, Morning players-site is down. Pre-orders aren’t possible anymore? Hello, does “add-ons promo pack” include all already published promo cards? Will be available in Essen? And cost? Hi Guys, if I need the game shipped to South Africa, can something be arranged? Johann: We don’t sell Scythe directly anymore, so while it can be arranged, you’ll need to order from a retailer. We sell to distributors, who sell to retailers around the world. So just tell a retailer in your area that you want it, and they’ll get it for you. Hi, Jamey. Will the second printing still be available tomorrow, the 20th of October? I only ask because I’ve already memorized the rules and am hoping to play it this weekend with friends. I pre-ordered a copy at my local game store, but they were unsure when they’d be available. Thanks for making such an awesome looking game! I’m excited to play! Daniel: The second printing arrived at our distribution broker’s warehouse today, and they’ll be sending it out to distributors this week. So retailers aren’t going to get it until next week. I’m sorry it won’t arrive in time for you to play with your friends. Jamey, no worries. Your ever speedy replies to questions are refreshing and a delight! We have a game group that meets every month, so we’re just happy we’ll get to play soon! Thank you so much for getting back to me and for updating the information on the page. You’re awesome! I’m wondering if i should buy that game in English or in French. Regarding bonus cards I saw we can buy separately. They will be available in French at Morning Players or there’s few chance… I don’t want to have the complete package in different languages. :) Btw, Amazing universe. Thanks for your question. The promo cards we’ve already printed are in French (the ones Morning Players has), but promo cards we print in the future will most likely just be in English. Hi Jamey, is the the french version will be release on octobre 20th like the English one in Canada? Thanks in advance! 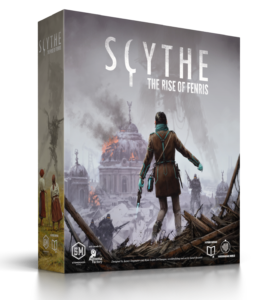 This week we’ll ship to Scythe to distributors worldwide, so retailers in Canada will have it soon after that. – Will you reprint all the premium contents and sell them on your website (coins, ressources, dials, card expansion). If yes, which contents? This way I can see if it’s worth paying now 25 USD, just to get the realistic ressources (which will be 55 usd just for it) or wait to get it on your website or french retailer, and order the rest when available. Will you reprint all the premium contents and sell them on your website (coins, ressources, dials, card expansion). Yes, we will reprint them, but no, they won’t be available directly from us. Everything listed on the webpage above–all accessories and promos. The only thing we probably won’t reprint is the art book, but if there’s demand, we’ll consider it. When can we here in Europe expect to be able to order Skythe? English or German? Obviously any additional add-ons, realistic resources and such will be later. But the base game, maybe with the large board update? Will that be available for ordering soon? I am so hyped by all the videos out there… can’t wait! Thanks, Jamey. Apparently it should be available to order German version in Europe but I still haven’t found anywhere or any page where I could order/preorder the game. Do you have an idea who will be selling in Europe if not you directly? The webpage you’re on right now. :) You can talk to any retailer in Europe and they can order the game for you. I sell to distributors, not to retailers. “answered in detail on this page” => what page? Koz: The webpage you’re on right now. You can order Scythe in Europe today (ask any retailer), and it will arrive in mid-November. Sadly, I can’t bring myself to buy this game due to how horribly cumbersome this process is. First off, having 1/3 of the Factory cards locked into Kickstarter only (or ordering them separately) is total BS. The replayability of the game is *significantly* different when you have 50% more cards to create variance. The game is beautiful, and I had fun playing my friends (kickstarted) copy, but for $80 (or more), I better be getting the ENTIRE game, not 80% of it. A themed kickstarter card here and there is fine, but (again), 1/3 of the cards is too much. At the very least, there should be a simple one-item order to get the game plus the added stuff that makes the game “complete” without shopping from 2-3 sites. Especially since I do the bulk of my shopping from a local game shop. And they do their shopping through a distributor. So getting in all the proper stuff through them is pretty much not going to happen (with them still making any profit). So I’m left with that result. I can’t simply get it via my local shop. I can’t simply get it online. And no matter what I do, I’m going to have a partial copy of the game. Our arrangements with Top Shelf and Meeplesource are such that any retailer can order in bulk at retail pricing from them. So per your request, all you have to do is go to one place–your local retailer–and tell them what you want, and they can do the rest. Jamey, I encourage you to fly out here to Corvallis, and do what I did. Go in to my retailer, and explain all the steps they have to go through to order a product from multiple sources (one of which they pretty much NEVER deal with otherwise). Splitting your product between two different distributors is crappy (even if I can understand why it happened). Splitting your full game into parts is extra crappy (really, 33% of your Factory cards not in the base game is BS). If you are “selling” multiple copies of your game that have different play experiences (which presence/lack of cards does), and it is NOT due to an expansion, you’ve already screwed up. Kickstarter/Convention bonuses, and any other exclusives should not significantly affect the flow of a game. There are other companies that annoy me equally for the Kickstarters (Xenoshyft is the only one that I am on the “backer” side of – and have all the parts – and it still irks me). Increasing Factory cards by 50% impacts the variance and replay strength of the game. Also increasing Objectives and Encounters just exacerbates that issue. So you’ve screwed the pooch on your backer v retail model. You’ve screwed the pooch on your distribution ease. And I’m beating a dead horse repeating myself. You obviously don’t think you’ve done anything wrong. But there are plenty out here like myself who think you missed the mark in a number of ways (and wish you didn’t, because we want to love your game). And the store I’m local to is not big enough to “bulk order” your stuff from a source (meeplesource) that they aren’t ordering anything else from. Only the most popular of games ever have more than 1 copy in stock at the store at a time. You live in St Louis, so I understand why you don’t consider small towns and small stores naturally. But we exist. Scott, you’re mentioning some important ideas here, and I’m going to this about them, but why would you end your comment with something like that? If you’re trying to work with someone, there’s no reason to condescend in this way. That was not condescension. That was pointing out that I can understand making a mistake re: small businesses because its not something you directly interact with on the small hobbyshop side. If you *do* interact with them, then I really can’t understand why you only offer retailer pricing on bulk orders. I also didn’t realize this was any kind of negotiation or ‘working with’. I seen it as me venting because of a great deal of frustration from encountering a game I like with a marketing deployment I loathe. I was under the assumption/impression that nothing I say would be able to change the system and improve my ability (and others in the same situation & viewpoint) to acquire a full* copy of your game without jumping through several hoops and overpaying** for what we are getting. ** – Overpaying on the additions. I believe your game is a solid $80 base game – but I can’t get it for $80. And even Twilight Imperium was only $80 base (and included more high quality board, more cards, more miniatures, more replay-variance, and more other components. Hey I’m just curious when the game will be available to buy again? It’ll be in stores this week. Are online retailers (e.g., Coolstuff, Miniature Market) also getting copies this week? Yes, they should both get their copies this week. I was wondering, when will Scythe be available to purchase in Australia? Scythe should arrive in Australia in 3 weeks. Hi Jamey. I missed out on the Kickstarter campaign, but I’ve truly enjoyed playing Scythe with some friend the last 2 months. If I wanted to purchase the Art Connoisseur Edition in Canada, how would I do that? Haddon: I’m glad you’ve had a good time with Scythe! While we no longer make the box that says “Art Connoisseur Collector’s Edition,” you can buy the items that were inside the box as noted at the top of this page (some of the reprinted items aren’t quite ready yet, but they will arrive in a few weeks). If I go that route, will the only difference be on the box itself? Will any of the games components be different as well? Any chance of making a realistically priced bundle? $250 plus taxes plus shipping for all of that! Would love to buy your game, but with everything included in it. Plus another $40 if I want the expansion! I just found out about this game recently during a weekend out with the boys. The game is phenomenal, and I would love to buy it, but the pricing and availability are killers! Jon: We offered that during the Kickstarter campaign, but that ended exactly 1 year ago. :) Meeplesource is a one-stop shop for all Scythe accessories and promos, so that’s how you can get everything at one place. I never heard about the kickstarter campaign. :( I only found out about the game when a friend brought it to the cabin for us to try out a few weeks ago. I just wish that the accessories were at a reasonable price to obtain everything, considering the game is already $90 by itself. Scythe is an $80 game. Our prices are based on the manufacturing costs of each item, just like any other board game or board game accessory. I understand your desire to get things cheaper, but we cannot stay in business if we’re losing money on the things we sell. Publishers (like Stonemaier) sell to distributors at a steep discount because of the way the supply chain works, so these are the best MSRPs we can offer. You’re welcome to shop around at various retailers to find a price for these items that fits your budget. Do you have a list of retailers (purchasable by Canadians) that will be getting the reprint version this week? Simon: Thanks for your questions! I’ll answer each one below. –Morning Players has the German promo packs, so I would recommend contacting them. –Yes. It’s language-independent, and it will be available in stores in Germany in late November. To ensure that your store stocks the board extension, tell them you want it. “will it be possible to pre-order the announced expansion Invaders from affar in german? –I’m not sure. If we find a publishing partner for a German version of Invaders from Afar, we will list that partner on our website. It is possible they will run a pre-order. Just for an update: Morning Players don’t list any promo packs on their webpage. Only the retail game in 3 languages. As for the Invaders from Afar expansion I will wait and see. shouldn’t a problem to find once it gets released (IF it gets released as german version). I only care to have the german version as most of my friends here in Switzerland prefer german as they don’t speak english so well. Still waiting to see it from online distributors. I am peeing myself with excitement. Been waiting for this for MONTHS! It’s at Cool Stuff Inc. now! My copy will be arriving in Friday. Can’t wait! I assume that this is the “promo pack” listed in the image above from the KS offering (given the $20 price point) but it doesn’t explicitly list what the contents of that promo pack are. How does this promo pack compare to the individual offerings listed at the top of the page? That looks like promo packs 1-5. Any notes/updates on where we can buy the promo packs/cards for german version? The above stated retailer (Morning Players) does not have them listed. They only sell the retail game in 3 languages but no promo packs. As for the game board extension is there a retailer at which we can Pre-order? ‘Top Shelf Gamer’ has it listed but just as ‘Sold out’. It would be helpful if we could just pre-order this item so we wouldn’t have to check availability every day as we believe once they have stock it won’t take long for them to be sold out again and we fear we might miss that opportunity. In the meantime I have received the german version of the game from a german retailer and I must say, the game looks even better than expected! The design (mostly thanks to the beautiful art) and the high quality of the items just makes you want to play this game more than any other ones! Fantastic! 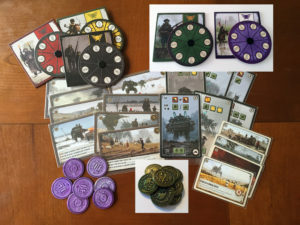 I was also able to order upgraded items from various retailers and hope they will arrive soon-ish (realistic resource tokens, metal coins, original faction combat dials) so that’s good. Simon: For any German components, please contact the German publisher, Morning Players. You can pre-order accessories (the board extension and metal coins) from any distributor. I know Esdevium is getting some. Hello, i’ve ordered my game from a philibert (France) and they haven’t got any news of it yet :) any news on the regular version availability there? Philibert probably ordered their games from Morning Players (in which case they should have them any day now) or Esdevium (in which case they should have them in about 2 weeks). For an accurate answer, Philibert needs to contact their distributor. Is there a date when more Automa cards will be available? We should have more when the third printing arrives in a few days. I have a question on the Automa cards. Will the 6 additional cards with the Invaders from Afar expansion be made available for purchase at some point? I wanted to get an additional Automa deck now that they are back in stock but realised it would not be fully compatible with the expansion. If I had 1 Automa deck which included the expansion cards and 1 that is from the base game, could I use the base deck for say a Polonia Automa and the full Automa deck for the Togawa Automa. Would this work? I assume the only purpose of the 6 new Automa cards is to add in the faction specific bonuses for the 2 new factions. Is this correct or do I need 2 full Automa decks if I want to use any of the expansion factions in an Automa game. Dave: Thanks for your question. We actually just received those cards yesterday, and I’ve now added them to the ala carte page. You only need 1 of them even if you have multiple Automa decks. Thanks for the clarification Jamey. Looks like the Automa decks sold out already. I guess I will have to wait until the next time you get a shipment. Hopefully you will continue to order more since there is so much demand for these decks. Man, that was fast. Okay, I’m going to fix that so it doesn’t happen again. We should get a new shipment on December 9. I know you have told me twice about getting the german promo packs/cards from Morning Players… I have also contacted/written them an email 2 weeks ago and have yet to get some kind of feedback. On their homepage they only list the retail game in 3 languages. I presume I am not the only one out there trying to get additional content but this isn’t really working for anyone and only casts a shadow on this oh so fantastic game. Which is a shame. I hope you can remediate soon. Simon: I’m sorry you haven’t had a good experience getting in touch with Morning Players. Of course we’re working with various companies to produce international versions of the expansion. It will be released in August 2017 in those languages. Thank you very much, Jamey. That is good news… even if we have to wait almost another year, but hey, at least it’s in the pipeline! Thanks! …And you should really consider producing the upcoming expansion in the already existing languages of the main game. Just a hint from my humble opinion. Hi, I want to know if a French version will be available in Quebec, Canada before Christmas? Really great game. Thanks for the quick answer. I sent a email to Juliette. Hey Neomie, have you received news from Juliette? I havent… :( I just hope that Morning Players havent forgot that we are 8 millions speaking french in Québec and that at least a few of those millions wants a french version of Scythe!!! ? Jamey, can you do something about it, pleeeaaase? Marc: I think the problem is probably that MP sold out of the French version of Scythe. However, we have a new French partner, and they should be able to sell in Canada in a few months. No I didn’t have any answer from Juliette. But I heard from a seller in Montreal it shouldn’t be before January. Soooooo far lol. By chance I have a friend with the collector edition. So beautiful. Hi, how can I make the order. I’m in Thailand. My biggest personal mistake of 2016 was passing on this kickstarter campaign. As soon as Jongetsgames did a playthrough, I knew I had to have it. This thing is selling out super fast. I’ve managed to get the base game and 2 encounter promo packs. Now I’m playing the waiting game with getting the rest of the add-on content. You hit a homerun with this one my friend! I’m grateful you chose not to make anything exclusive. Has anyone even played this game, I only read about complaints. Hi. Iwould like to know when this game will be available at shops in Greece. Thanks. It should be available in Greece next week. 1) Automa just refers to single player? I assume 1 deck simply means 1 AI opponent? 2) Since there is high demand, will you continue to produce the base game, expansion, promos well into 2017? I was just curious if there is an expected development halt in the next few months. Furthermore, could it be sold as the base + expansion together? 3) I know the game was intended for 5 players max. The new expansion opens up the other factions, but allows for 6-7 now. With the base retail cards, would repetition be a problem? The same goes for the map size. I know the extension isn’t available yet but would that be ‘highly’ recommended for 6-7 player games? Or is it just for extended game time and strategy? Thanks for your time. Hope to play the game soon! 1. Yes, Automa is the solo variant AI. The game comes with 1 Automa deck, but some people like to play against multiple Automas, and each one needs a deck. 2. Yes, as long as there’s demand, we’ll keep making stuff. The expansion and the base game won’t be sold together. 3. The base game of Scythe allows for 25 different combinations of faction/player mats, plus plenty of variability with the encounter, objective, and factory cards. The expansion–which many retailers are receiving this week and next week–is not necessary unless you want to play with 6-7 players (the base game can’t do that). The expansion mainly just adds more variety by giving players more factions to mix in at any player counts. Is there any way I can buy everything (including the expansion) at once? Are they all out in stores? Thomas: I don’t think there’s any store that has everything, but Meeplesource has most things. The games and accessories are in stores (and more are arriving this week and next week). I am looking for the collectors edition. Any leads on where i can find it? Can i order it? If you want all the stuff in the Collector’s Edition box, you can buy that stuff as instructed on this page. If you want the box that says “Collector’s Edition,” you can look on the secondary market (e.g., eBay). Any estimate on when the second reprint and expansion will reach Australian retailers? PS: Thanks for making Scythe available on Tabletop Simulator, played and loved it. DAP: I think it has already arrived at some stores. We had a few distributors buy directly from us (from China)–some have arrived, and more are arriving this week. Hi, I would like to buy the game in France (English version is ok) do you know when I can get it? (Christmas present possibility?? :)) thank you! Thank you very much for responding! Have a good night / day wherever you are! Oliver: I’m sorry, but that assumption is incorrect. As stated on this page, “The only version of Scythe we now make is the retail version. We also make the various accessories and promos, and they’re available separately.” Nothing is exclusive to Kickstarter, so if you follow the instructions on this page, you can buy all the stuff that came in the original collector’s edition. When will scythe be arriving in canada? Hi, when will Scythe (English version) be arriving in Sweden? Richard: It has already arrived and sold out. I would recommend checking with your preferred retailer to see when their distributor is getting more copies. I contacted a few local stores that are on the google doc that you provided and none have received the game as of yet. I’m in Colorado. Were the games scheduled to have arrived here by now? Ryan: Many of the shipments are still en route to distributors. After they arrive, they’ll be shipped to retailers. Which stretch goals are included on the retail version? All of them except for the promos. See the big chart at the top of this page. How do I get the watch it played and dice tower promos? They’ll be available from Meeplesource next fall. Are there plans to keep doing reprints of the retail game into 2017 and beyond? I’ve noticed that while the promo content and expansions are available, there is still a shortage on the main game. Most places I’ve seen it available for preorder are charging a significant markup from MSRP due to supply shortages. John: We continue to print Scythe as fast as we can. The third printing has been arriving in stores over the last couple of days and will continue to do so over the next week. Then the fourth printing will arrive. The fifth printing is due to arrive in stores in mid-March. Will it be possible to buy the bigger board and metal coins in Belgium ? Or do i have to order these in the US ? Reading the above, i expect the game to arrive here any day as well. Koene: It may be possible to soon buy the board and coins in Belgium, but it depends on whether or not the store ordered them from a distributor. i have one more question regarding this game. The stuff above has arrived at my store. Great ! But there are no resource tokens. They said they’re not comming to Europe, is that correct ? They’re so great and such a big addon to the game. Probably my question is a bit weird. I’m from Russia and we’re awaiting for the game localization. There are many disputes how it’s better to translate game title. I already played this game couple of times and all around me call it “scythe” (“коса”). But many people translate it as “sickle” (“серп”). They say that “c” letter in game title looks like a sickle. Sickle is also a symbol of communism which is reflected in game arts. Thanks for your question! Our partner is Russia used “серп”. It’s meant to represent a farming instrument and a weapon of war, not a style of government. However it’s a stumbling block now and pretty much people would like it to be translated as “коса”. So, I just wonder what authors have in mind :) I thought that maybe it’s a reference to these Polish guys armed with the scyths: https://pl.wikipedia.org/wiki/Kosynierzy. Also scythe is better weapon of war rather than sickle. But in any case it’s a great game with wonderful ambience! Thank you all! Krak: Thanks for your question, but we can’t do that. It would be too expensive to be marketable at scale, and some people only want some of the special items, not all of them, so we don’t want to put them in a position where they have to buy things they don’t want. The current systems allows you to choose exactly what you want. Wow, thanks for the quick answer. I think a bundle set would make it simplifer for customer who bought the game retail and want to enhance it. Doesn’t mean you have stop offering individual add on, just think a bundle set would appeal to a lot of people and make it simplifer. Lile my usual shop only took the metal coin, the art book has to be ordered somewhere else, and the other stuff from a third source. That’s true, it would appeal to some people. But there’s a big difference between some people and 1000 people (the minimum print run). I appreciate the input, Krak, but I know we won’t be making that type of bundle. Instead, people can just put all of those items into their cart on Meeplesource and order them all at once–it’s exactly the same as a bundle. But, just to demonstrate, what if we created this bundle (which we’re not going to do, but for sake of example) and you saw it in your shop for $200. You want 3 of the items in the box, but you already have 5 of the items. How would you feel about that? Thanks Jamey for your answer, I’m feeling bad about spamming since I guess you have other stuff to do than answer me. I didn’t mean to do a special print run for those, just to bundle them together on top of the single items. just offer a special set with all of them as well, for ease (and maybe a bit of saving). As far as I see the artbook is not available from Meeple source, and as someone who missed the KS I’m a bit confused as to what all I need with so many different items, if I just want the art connoisseur extras. I’m from France, there are 4 retailers listed on your file, but 2 are the same meisa and cafe meisa (and are not an online shop), one is the french distributor for the french version, so that leaves Philibert who I contacted about getting the extra stuff and they said they won’t. So as nothing was exclusive, I was just looking for a way to bring my edition of the game to the same level as the KS one (so pissed I missed it). I understand, and I appreciate your desire to get all the things. I think the key is that if we bundle things, it has to happen at the manufacturer level, and the manufacturer minimum is 1000 copies of anything. That’s why we use platforms like Meeplesource that let people create their own bundle. It does make things a little more difficult–that’s the problem with having so many accessories and promos, as most stores don’t want to carry all of these little things. But I don’t think there’s a better solution. I just can’t see many people buying a $130 bundle pack of Scythe accessories and promos that doesn’t even include the game, nor a $200 version of Scythe with the game and all that other stuff. It’s just not marketable at scale. The chart on this page shows the extra stuff in each of the versions of the KS games. Maybe you can have meeple source do a bundle of all the needed stuff (with the artbook as well). Scythe is getting tone of positive review, so I’m not so sure that over 1000 people wouldn’t be ready to pay 130$ for the bundle, just check the prices on ebay. I can’t find board game extensions any where. Does anyone know where they are? I’ve looked at funagain games and cool stuff inc. Everyone just keeps saying they aren’t in stock. I got everything else. Ordered Scythe, expansion, extra resource tokens, promo pack, and the Broken token organizer. Will the promo’s that aren’t out yet be bundled as well? I really want all of them. The current supply is in distribution, so they should be available somewhere. Have you checked our retailer locator? I’ve checked Funagain Games, Cool stuff inc, and meeple source. I’m looking at the spread sheet for retailers. Every one I look at so far say out of stock or back order. I have been monitoring the pages daily since late November. Like I said, everything else I have found and already received in the mail. This is the only thing I can’t find any where. It’s hard for me to know who has it–lots of layers to this system. But if they really are sold out of the current print run, we have another print run in the works. What I’m saying is I haven’t seen the run that was supposed to hit dec 1-8 ever happen, I’ve been literally watching the pages and have been signed up for notifications on both funagain and cool stuff inc since october. Everything else came in except that one item (Board game extension). I just finished checking ever single online retailer in your list, none have it. David: Thanks for clarifying. I’m not quite sure why that is, because we’ve sold that entire run to distributors. I know that’s not helpful for you, but if I hear anything, I’ll post a comment here so you know! @David, where did you find the realistic resource tokens if you don’t mind me asking? I didn’t see the realistic resource or metal coins come in any where either, but I wasn’t specifically watching them. added a notification to them today. I too am trying to get the extension and coins from Coolstuff Inc. Invaders from Afar came back in stock at Coolstuff Inc. from the Dec. 1-8 shipment. I’m guessing that every copy they ordered of the extension and coins sold out via pre-order before they received the stock. I don’t know how many copies over their pre-order quantity they order but I’m guessing that the demand is so overwhelming for these items that they are selling it all before it even gets to them and as soon as they get a shipment, it all goes to fill pre-orders. Eventually, supply will catch up to demand. Until then, you’ll just have to watch the availability like a hawk. actually I haven’t ever seen the ability to preorder on either funagain or cool stuff for board extension. I see a preorder onot cool stuff that you can’t click….and like I said I have had notifications on since october. I never got notified about the board extensions. so unless they did pre-orders in store only locally, I’m not sure what happened. I saw the extension go from out of stock to pre-order sometime last week for about 5 minutes. Either someone canceled a pre-order or they upped the availability due to placing an order with the distributor and then everyone jumped on it like vultures and it went out of stock again. The problem with coolstuff’s back in stock notifications that I’ve noticed is a lot of times I don’t get the notification until several hours after it is actually back in stock. I’ve gotten back in stock e-mails before and when I got to the site, the product was out of stock yet again. It is frustrating, I know, but eventually supply will catch up to demand. You’ll just have to be patient. I know, easier said than done! I was checking the page everyou morning and night on both funagain and cool stuff. I’d they ever had stock posted I would have seen it, unless it was a crazy run on it in the middle of the day or something. I was checking every 30 minutes when I saw the extension go from out of stock to pre-order. I never saw that happen on funagain. I did see it on cool stuff, but it wasn’t click able for me., just green text. it’s actually still like that. Bit of a shame that there are a lot of demands for this add’on and there is no edition packaged with all those extra bonuses. Eddy: We don’t offer that because it wouldn’t be fair to people who only want a few of the many promos and accessories–we don’t like asking people to pay for something they don’t want. Also, the economics of it simply don’t work out in retail–the fully bundled version would cost at least $200. Instead, we offer an ala carte version so people can choose exactly what they want based on their desires and budget. If that doesn’t appeal to you, you can look for the Art Connoisseur Collector’s Edition on the secondary market. It seems that meeplesource.com has the expansion, the extension and coins. @Jamey Thanks for your answer. Also some of the extra are still not available it seems. Art connoisseur price are out of control on secondary market at the moment. Eddy: As noted on this page, any retailer in any country can buy these items from distributors and from Meeplesource. It’s a perfectly fair system for people like you who don’t want to pay shipping fees–it just requires you to tell your preferred retailer you want that stuff. Kruzada: It sounds like they had an order with a distributor, but the distributor didn’t order enough for them. We’re making more coins, and they should be available to retailers in early March. @Jamey Stegmaier asked them and they say they can’t get them if their distributor doesn’t. Are realistic resources available anywhere ? Any EU shop selling the art book ? Eddy: Sorry to hear that. The only place I know of that has the art book is Artstation, and Top Shelf Gamer has the realistic resources (I think they just ran out of the first shipment we sent them, but they’re getting more very soon). Is there any more info on the promo stuff coming out in 2017? Specifically I’m wondering about the 2 expansion factions power dials. My game feels incomplete without them now that I have found everything else, thanks for the help by the way! David: They’ll soon be in transit from China to the US, and they should be in stock at Meeplesource in early February. Thanks I found the link, and was able to pre-order them. Your the Best! The game is completely sold out in Sweden or Denmark, any news on a new european release or any web page that might have it? Pablo: Our distributor for your area is actually just getting the game to retailers this week, so you should see a restock quite soon. 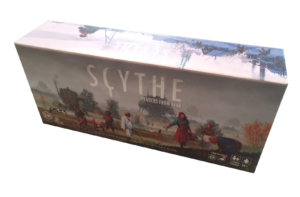 Hello mr. Stegmaier…Do you happen to know when is the retail version of Scythe going to be available in Greek stores ? There are some copies in very few shops but your official retailer in Greece (Game Rules) still hasn’t received any copies of the base game even though the expansion is due to arrive on Monday. George: It’s possible stores in Greece will get copies of Scythe and the expansion from Enigma (a distributor in Europe) this week. However, if that doesn’t happen, a Greek distributor is picking up some copies of Scythe for distribution in March. Hi. Any idea when the Invaders from Afar will hit Canada? I placed a pre-order back in October but the store says they haven’t received the shipment yet. I’m sorry it’s taken so long, Frank. At this point, I’m not quite sure why it’s taking so long–we shipped the expansion to Canadian distributors 2 weeks ago. Hi, just wonder when will the scythe collector version, metal coins, resource bundle and extension board be back in stock? Is there anyway that we can get the notification when they are back? The only version of Scythe we make now is the retail version, which is now in stock along with all of the various accessories and promos (available separately through retailers). There is no bundle. You can see on this page how to get those items and how to sign up for our monthly e-newsletter. I bought the German version of Scythe by Morning Players. Your German partner for the expansion and the reprint of the basic game will be Feuerland. Will the Feuerland expension Invaders from Afar be combinable with the basic game by Morning Players? Hi Ben: Thanks for your question. Yes, it’ll be completely seamless. All of these versions are produced in conjunction with Stonemaier, so they’re the same (other than the language). Your game is really awesome and i really like it. I’m from France, i wonder if i can order the “Art Connoisseur Edition” ? Thanks Thomas! You can’t order the box that says “Art Connoisseur Edition,” but you can order all the stuff in that box (see details on this page). I’ll order it soon with Meisia, hope it’ll be quick. So there are a lot of links on this page and I’m confused where to go if I want to buy retail scythe. can someone help me out? Also, where do I go if I want to buy the Premium or Collector edition? You can also buy Scythe accessories from those retailers, which will make your version of Scythe the same as the premium or Collector’s Edition. Or if you really want the box that says “Collector’s Edition,” you can look on ebay. Hi Jaime…I can’t believe how awesome a game you created…i was slightly skeptical about all the hype surrounding it but after playing it a few times its the ONLY game i want to play…unfortunately i dont have my own copy yet and just received an email from coolstuff but by the time i went to oder it…they had sold out in less than 5 hours…I really hope you’re cracking the whip on production?…Hurry! I want this game! Thanks for your interest in the art book! We’re gauging interest to see if there’s enough demand to justify another print run (1000-copy minimum). I’ll try to make the future printing request form more visible. May I ask where you looked for it on the website? Perhaps I can put it in a more obvious place. Thanks for the fast response! Perhaps if the form was somewhere on ArtStation where the book is sold? I’m not sure how much control you’d have over that, but that would be a great place to put it! I found the link by going through the comments to see if people have asked for a reprint yet. Maybe also in the FAQs perhaps? Would you ever consider selling the books through a print-on-demand printer like through CreateSpace which is easily sold through Amazon? Those are good ideas! I’ve added the link as an option under the About tab, and I’ve asked Artstation to add it on their page. As for CreateSpace, I’ll talk to Jakub about that. 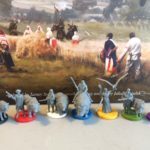 Hi Jamey, quick question: will anything be changed in the new printing of Scythe (graphics, figurines, stuff like that)? Thank you in advance for taking the time to read this! Tere: Thanks for your question. The changes are really, really subtle, like small clarifications in the rules, strengthening of the miniatures, and one little slash on a player mat that needed to be highlighted better. Most people wouldn’t notice this stuff, as it’s really subtle. Can replacement pieces be purchased… such as structures, upgrade cubes and such? Hi Jamey, been wanting to play your great game for a while. I’m waiting for the retailer availability on January 10th, but I wanted to know if the game will be available from retailers on the 10th, or will it ship to retailers on the 10th. Law: Thanks for your question. I’m going to update that date a little bit to meet my intention, which is to list the date when most retailers in the US will receive the game from distributors. This particular shipment has been stuck in customs for almost the entire month of December, and it’s finally moving forward now. My conservative estimate for when retailers will receive it is January 17. Thanks for making a great game. It replaces power grid as my new favorite. My only complaint is that it is impossible to find the extended board and I would have liked a separate attack wheel for each faction. Also, the final scoring bonus tiles are a little confusing trying to figure out what the graphics mean. Maybe a verbal explanation of each tile would be helpful. The verbal explanation of each structure scoring tiles is in the rules on page 19. I love everything I have seen about this game! In fact, I have already preordered all of the upgrades from Meeplesource and Topshelf. HOWEVER, I have been unable to locate a retail copy of the actual game anywhere (aside from some huge price gougers). Do you know when copies of the retail version will be available again here in the states (and/or where I should try to put myself in an electronic cue for notification? Thanks! Leigh: Thanks for your patience. There was a big stock that arrived in the UK in December, but it quickly sold out. There should be more copies arriving there in early February. Thank you for the reply. I’ve found I can pre-order from Meeples Corner in the UK so hopefully I will get assigned a copy from the February batch. I’ve recently found out about Scythe and I’m super excited to try it out. Can’t find a primary market copy of it however. I’m a retailer and have access to Southern Hobby, and Alliance, but neither has it in stock for retailers. Any idea when I should expect copies to either hit distribution chains or retailers? darkclokz: Thanks for your question. I keep the dates updated at the top of this page: The current date for the next print run to reach retailers is January 17.
just discovered this game on a Youtube review, I don’t get the Meeplesource items, esppecially the 82$ lot for “complete set for scythe” is it the game with 82 pieces? If not what’s the point of having all the tokens twice? The Meeplesource package is for all Scythe promos and add-on items, not for stuff that’s already in the retail game. The main board and board extension sizes are noted on the chart on this page. The only version of Scythe we now make is the retail version. You can order the game and the various accessories and promos from retailers worldwide. The realistic resources (STM608) will be available from Top Shelf Gamer on February 7. Hi, Really interested here. Would like to know if any of the above retailers ship worldwide? Say to Sri Lanka? Hi Jim, thanks for your question. I’m not sure, but you could reach out to some of the nearby retailers in neighboring countries to see if they’ll ship to Sri Lanka. Hey there, I live in Canada and noticed the date was pushed back a bit towards the end of the month for US release. Same goes for up north here? Looking forward to finding a copy this month if possible! Great, thanks for the info Jamey! Hello, I appreciate your quick responses. I am new to table top gaming and will be pre-ordering a retail version of Scythe this afternoon, but from reading some of the above comments and looking at all the various options I am a little confused. If I get the retail version of the game, is that the full “experience”? With all the ‘Promo’ content listed… do I need to get these additional encounter cards etc to get the game? Again, my apologies since I am new to this- but I am used to buying a game then getting expansions as I go (if I choose). I am referring to Scott Snelling October 31, 2016 at 7:02 am post and am second guessing things. As a noob, what exactly do I need to really enjoy the game? I dont want to put down $80 and feel I am not getting the full experience. Brent: You’re definitely getting the full experience via the retail version (we wouldn’t release any version of our game that isn’t the full experience). Scott is entitled to his opinion, but there are tens of thousands of other people who have bought, played, and enjoyed the retail version of Scythe. Hey, Jamey, are there plans to release a promo pack for the special faction Automa cards so I can have two decks for the factions when I buy additional decks from Meeplesource? Jamey, when will Scythe be back in stock in the UK? Anh: A few weeks after US availability, which is updated frequently on this page. Thanks. I’ll pin Feb 7 on my calendar. Just bought your game on Tabletop Simulator and I am now addicted. I was wondering if there would be international retail games (French) in the upcoming January reprint ? Thank you in advance, absolutely love your game. Jean-Francois: Thanks, I’m glad you’re enjoying it! The new French version will be available in France and Canada in March. I ordered Sycthe (english version) two month ago at my local retailer in Austria. Since then, the store stuff keeps telling me, that the game will be available in Austria “next week”. Well, it’s been 2 month now and I’m tired of hearing the same apologies every week. When will the game be available in Austria? Thank you! Katharina and Napo: I’m sorry that your store hasn’t been able to get a copy for you. They probably thought they were going to get copies in December, but their distributor didn’t order enough from us. The latest printing is being shipped to distributors this week, so if your store’s distributor orders more copies from us, it should arrive in Austria in a few weeks. If the distributor didn’t order copies, it could be as late as March 10 before more copies are in Europe. OliV: Yes, all of the promo cards will be available as separate purchases from our various international partners in their local languages, including French. Goodness, I want to play this game, and would easily pay $100+m to do so, but this is way too much spreading of things and figuring out how to make sure I get the complete experience and not a watered down version. People are right, you need an option where I can click “add to cart” and get everything from one purchase, not this chasing everything to ensure I have the full game. Too many other games deserving of my money that don’t do this nonsense. Thanks for sharing your opinion! My opinion is slightly different: I want to give people the opportunity to pick and choose exactly what they want instead of bundling things in such a way that they have to buy stuff they don’t want. And yes, it would be convenient for people to do that just from our website, but we’re a publisher, not a shipping and handling company. In reality, there are only three sources you need to go to if you truly want everything: any game store, Top Shelf Gamer, and Meeplesource. It’s not that complicated. That’s 2 sources too many to buy one complete game though. You don’t have to make them buy things they don’t want, you simply need a single bundle available with a “complete” label priced appropriately, as customer service 101 is making things as easy as possible for your customers and telling them to go to 3 different sources is the opposite of that. Anyhow, thought I should check in with you to see if there is any word on shipments arriving – before I drive all those customer service workers buggy! Thanks so much! Can’t wait to play the game!! Do you have any idea when Coolstuff is getting the game ? Other than the dates posted on this page, no, I don’t know exactly when. what’s happen jamey why the retail got delayed ? There are many layers to the supply chain, Garaaspakyo. Our broker has to process and ship the games. FedEx has to deliver them to distributors. Distributors have to process and ship them to retailers. My estimate was January 24, and some retailers have already gotten their games. Others will get theirs in a few days. It’s just an estimate. Thank you Jamey I really appreciate your hard work . Hi Jamey, my local retailer in the US did get a shipment but quickly sold out. Do you have an estimate of when another wave goes out to US retailers? Sean: Thanks for your question. Retailers should get the next batch around March 1. I’ve been watching all my online retailers since the 17th, but nothing there yet. This is like watching for Santa to come down the chimney!! ? hello, my local retailer said its still not available from his distributor- is this something that will pop up as available between now and the 31st? Then he can order it for me? I am sure every case is different, but when he looks it says unavailable- is this current printing so limited not every distributor will have enough to carry, did I miss out? brent: Thanks for your question. This printing was allocated, meaning that every distributor got some copies. I think every distributor has received them at this point, but sometimes there’s miscommunication within each distributor (like, the buyer doesn’t talk to the sales guy). All I know is he checks his computer and it shows as unavailable. So from your understanding are all copies from this last printing sold out? Thanks for the response- I never expected such direct info! Kudos. Brent: It’s possible they’re still en route to the distributor–sometimes FedEx freight is slow (but rarely). All I know is that all copies in the warehouse are sold out to distributors, and all of those copies were shipped from the warehouse to distributors in the US last week (shipments to international distributors were dispatched this week). Hi, sorry for hijacking the thread, but I have a related question: what’s the situation with Europe? One of my local shops is claiming their distributor still has no copies, another one estimates availability all the way in APRIL – whereas this page says in stock now? Tom: Thanks for your question. The key part on this page you’re missing is “(add 1-4 weeks for other countries).” The fourth printing of Scythe should arrive in Europe in mid-February. Just wondering what is the cardboard insert listed in the content of the pledge on the KS page ? Also I don’t see it listed but the metal coin replace the cardboard or should I find the cardboard coin in my collector box ? Frank: We actually replaced the cardboard insert after the campaign ended with a plastic insert. 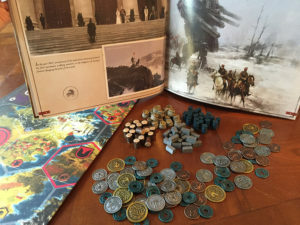 The cardboard coins are on the punchboards in every edition (though if you have the metal coins, you don’t need them at all). Thanks, just bought a collector edition from someone else so checking on the content. So the insert is the one holding the miniature then? That’s correct, the insert holds the miniatures, and those are the promos that we didn’t make until recently (they aren’t in the Kickstarter editions). Also can’t find the plastic clip for the board extension but they are not listed in the rulebook, just on the KS ? Bit confused on the automa card, as I seems to have 19 of a kind and 4 with the difficulty level. Then 8 others cards I dont see listed but that seems related to automa, with a grey background. Also what are the realistic ressources made of? They feel nice and heavy, however one of the gas barrel is chipped, and that’s how I saw they were not made of metal ? There are 23 total Automa cards, so you have everything. Realistic resources are made of resin (grain, wood, and oil) and zinc (metal ingot). Jamey, I just bought Scythe today from a comic and game store here in Sacramento, CA. I’m concerned because the box front doesn’t quite match all the other images I’ve seen on the Internet. On the lower right hand corner are three icons/wording in this order: 1-5 players, 14+, and 115 minutes. None of the other images I’ve seen show the 14+ icon. Do I have the correct and newest version? The copyright date in 2015. Judy: Thanks for your question. You have the right version (and a keen eye). We added the 14+ on the second printing and beyond, but it’s the same game as before. A bit of an awkward question, but do you envisage a second edition or reprint which includes the errata, clarifications, faqs and improvements gathered so far? If so, when would this be made available? Shak: Thanks for your question. In each reprint of Scythe, we’ve fixed a few typos in the rules and clarified a few things. As seen on the FAQ (https://stonemaiergames.com/games/scythe/faq-scythe/), there are only two errata to the rules, and they’re really small things. You can just print out those two paragraphs and put them in your game, and your game will be up to date. I would like to ask 2 questions.The first is if you plan on publishing a Greek version of the game and the my second is, why there is a place for the remaining objective cards on the map? Is there any rule that we missed allowing the a player to draw objective cards during a game? Konstantinos: I’d love to make a Greek version, but we first need to find a partner in Greece who can commit to at least 1000 copies (that’s the minimum print run in any language). There’s a place on the board for the objective cards in case a future expansion has players draw cards from the objective deck or interact with it in different ways. There is no such interaction in the base game. As an Italian customer, where con i find Metal Coins? Does these ever will produce for international shipping? Hello, while waiting for the board extensions to reach the Netherlands I wander how it van attached to the main board. The boards are pretty thick and heavy–they’ll slide up to each other seamlessly and will stay that way while you play. Yay! That is good to hear though I suspect our local Games Shop will have a mob outside on that day…. Hello Jamey. The game is beautiful. So beautiful I am upgrading various bits (like the resource tokens) that were not part of my special edition copy. I am having a miniature painter paint all the minis. He is doing about 10 copies at the moment. He has pointed out that all of my main characters (specifically the animals) are clearly smooth bodied whereas most of the others are much more detailed in terms of fur. Do I have a duff copy? How can I get the more detailed minis? Thanks for the response Jamey. I’d say it was a lot more than a subtle difference. From a metre away the difference is quite pronounced. Thanks for the link but as mine are already being painted I dont need a replacement. It will be no bother for him to paint them. I just thought it would be easier for him to paint fur on the textured model rather than to paint fur. Glad I dont have an illegitimate copy. Congrats again on your game. Hi Jamey, do you know & can you advise which online retailer in Europe stocks Promos #8, #9 and #10 (i.e. the non-Kickstarter promos)? The shipping costs from Meeplesource (US) to Europe are prohibitive. Thanks a lot Jamey, this is helpful! I checked them out, and unfortunately they’re all out of stock at this moment. Do you know if there is another batch of the non-KS promos coming up some time later this year? Are you producing anymore of the board size expansions? They’re out of stock everywhere but Amazon ($33 ?). Definitely! You shouldn’t pay more than $12 for it. Thanks, Jamey! I really appreciate the quick reply! Congratulations on the great game! My family loves it! Also, do you have a timeline for when they will be shipped to distributors? We’ll ship them to distributors in late April, so retailers will have them in early May. Thanks again! Also, I’ve been reading your blog since I saw that you do way more than just publish games, and I really appreciate all of the leadership tips you’ve put on there. The section about social tips for introverts is also very helpful. Have a great day! So, silly question, but, is there a way to buy the clips for the board extensions? It’s a fair question! :) We don’t have any functional clips for the board extension. Fortunately, however, the board is heavy and flat enough that it really doesn’t slide around at all–I’m not aware of anyone who uses clips to hold them together. Will the Promo encounter cards 37,38,39, & 40 be sold at Meeple Source as a bundle? I’ve got to have them all!! LOL Loving the game! Have two friends who have also purchased it since we began playing! Tod: Thanks for sharing Scythe with your friends! We’ll definitely be selling the promos individually through Meeplesource, as some people have 1 or 2 of them and don’t want redundant copies. But it’s possible that Meeplesource will bundle some of them too. The game is so great I want my own copy, but they sell out so fast. Any idea when Amazon will get more in stock? Thanks Richard! Retailers will get a restock of Scythe in late May. I keep that date updated at the top of this page. So I finally got to play Scythe this weekend (it was a friends game) with the nice pieces and I LOVED IT. What an awesome game. I wish I could order this but everywhere is sold out and eBay is super inflated. Sorry I missed out on the kickstarter. I jumped in on the nice resources/metal tokens preorder via meeple but now I anxiously await the game and hope to order the extension board and the expansion as well. Hopefully I’ll be able to grab the game itself someday. it’d be kind of silly just to own the nice resources and pretend money with no game. I really hope you have enough supply so I can get one this time. Congratulations on making such an amazing game. It’s a ton of fun and I love the different ways you can win. The theme is fantastic. I’m very impressed. Congratulations and best wishes on success. It looks like the player boards are notched so the pieces for nested in there spots. My questions , is this the case ? Second question does the non collector addition have those same boards? Lastly what is the difference of each addition? In all seriousness I have a question about organizing the game. I’m on the brink of buying an organizer from broken token but am hesitating because you have more expansions inbound. I don’t expect you to release news early but I’m trying to gauge if it’s safer to wait. Its a bit of an investment and I would prefer to have an all inclusive set. Thanks for all your help and again…congrats on a fantastic game. We do have one expansion (The Wind Gambit) that will soon enter production and one final expansion that we’re in the early design stages on. While those expansions won’t fit in the box, they won’t negate the utility of fancy inserts. I will tell a little about myself. My name is Victoriya and I’m from Russia. First of all, I want to thank you for your wonderful games. I’m your fan in the good sense of this word. Scythe is the best game I’ve ever played! Thank you for your creativity and work, and for helping to develop the world of board games in Russia. P.S. Sorry for my english, it’s not very good. Victoriya: Thank you so much! That’s very nice of you to say, and I’m glad you’ve had fun with Scythe. I’m glad we had the opportunity to work with Moroz in Russia. Also, your English is quite good! As we can start reading some details on the Wind Gambit expansion in different sites, including this one, can you confirm if there will be seven different flying battleships miniatures in this new expansion – 5 matching the base game factions + 2 for the factions of the Afar expansion? Which would also mean at least 7 tiles for non-agressive actions and 7 tiles for aggresive actions, right? The idea of bringing new ways to end the game through resolution tiles is brilliant and brings a new dimension to the strategy. What is the plan for release date? Will it be available in English only first? If there’s some, what kind of delay could we expect for a French version (Matagot) in Canada? Excellent game. Can’t wait to have all the details regarding this second expansion (and hopefully soon enough the third one). Continue the good work. And a big thanks for this post – and your quick answers. congratulations to your fantastic game. I am from Germany and I love it! It is my favourite game up to now, but I have a problem. One of my workers was produced with a mistake. It is broken right through the middle and I have only a half piece of it. Do you know, where I can get a spare part? Thank you very much. I’m becoming a bit of a completionist with my Scythe stuff, and am wondering whether encounter cards #37-#42 are going to be available in the UK? Also, is it likely that these will be bundled as one pack eventually, and if so, do you have a timescale for this? Stephen: The current plan (which is somewhat contingent on when those creators fulfill their rewards) is to release them in time for the winter holidays. They’ll be offered as a bundle and individually. Will the 37-42 bundle be also available in the BGGStore? Hello Jamey, I just bought the game and I love it, so I’m looking to get all the extra stuff. It seems like the only way to get them in one go is MeepleSource, with their Scythe Easy Bundle #1, which includes Scythe Promo Items, Accessories, and Expansions. The only problem is that they’re asking $170.00 for the bundle. Don’t you think that’s way too much overpriced? I understand one cannot expect the same price of a KS campaign, which I unfortunately missed, but $170.00 for the extra stuff only is INSANE. I could have understand if game was included..but it’s not. Also all the material is being constantly printed, so we’re not talking about sold out stuff. During KS the art Connoisseur edition was $120, and core game was included! And and top of that I would have to pay custom fees (and shipping I guess) since I live in Germany. So is there any way to get EVERYTHING Scythe at a decent price, maybe in Europe so custom fees can be avoided? Marcello: Thanks for your question about the pricing of these products. As I’m sure you know, pricing during Kickstarter is very different than after Kickstarter. In fact, the second the Kickstarter ended, the prices increases significantly to match their MSRP, and that was 18 months ago. You just mentioned on bgg that it is possible to buy the “redone” miniatures currently included in the retail box. I don’t see this option listed anywhere. I am a kickstarter buyer and would like to have that option. Thank you. Tom: Sure, it’s listed on this page under “Ala Carte”. Hey! Lazy enough to read all the questions, so how can buy only the board expansion? Maybe you can add the link..
Rando: You can buy the board extension from a variety of retailers, hence no direct link. I think we will release them on November 1 through Meeplesource (and through retailers they supply around the world). Will there be new riverwalk cards produced that show the new faction’s riverwalk abilities? Chad: Good question, but we don’t plan on making such cards, as both Albion and Togawa have access to nearly every space on the board based on their riverwalk abilities. Yeah, that’s what I figured. Thanks. Unrelated question: How will the new expansion effect the automa? Can’t wait for the airships, btw! Thanks! The Automa focuses on aggressive airship tiles, creating some interesting interactions. Sergio: Thanks for your question. The retail version of the game comes with more than everything you need to play. Beyond that you can pick and choose from the items on this page that you’re interested in (but none of them are necessary). Meeplesource has the expansion promo power dials. Hope to see another KS for Scythe with a box to contain all expansions! Is there a possibility of this happening? This will be GREAT! Hi, my question is about expansions. I know there will be three in total, do you have maybe plan to sell them all in one bundle box version. We got upgreaded KS version of the game and in the future we want all expansions so bundle like this (with better price than each one sold separately we hope :) ) will be nice idea. Right, we’re going to continue to sell everything separately. That way people can pick and choose what they want, and people who have already bought some things don’t feel like we’re forcing them to buy some stuff they already have just to get the new stuff. Yes I understand that all things will be sold still separately, I just think that there could be additional option to buy all expansions in one, so you can pick what you want to buy and if you want all of them you got perfect option all-in-one box. Hey Jamey. Just got my Legendary Box. Looks fantastic. Is there anywhere out there that has the best way to pack it? I don’t have a Broken Token organizer but a buddy does and it seems to fit pretty well with that. Any official word on how to use the mini boxes that come with it? Thanks!! Hi Jamey, love the legendary box. Only flaw it has in my opinion is that the dimensions are a tiny bit to small. If I put the expansions into the cardboard boxes with the plastic trays, it feels just a little bit too tight and is a real hassle to pack everything. Dont get me wrong, it does fit, but I can easily see people ripping their boxes, because of applying too much pressure for example. And well… the tradeoff of making it bigger being that you cannot fit your original box top on it? seriously, who does that ;) would have loved dimensions that allow putting the original boxes directly into the “big box”. Patrick: I see your point, though a lot of the feedback I got before making the box was that people (especially original Kickstarter backers) wanted the chance to keep using their original box lid. That’s why the box is designed the way it is. Is there somewhere I can buy Scythe with the metal coins included? Or do I have to buy the game and then the metal coin add-on? Josh: We sell all Scythe expansions, accessories, and promos ala carte so people can pick and choose exactly what they want. 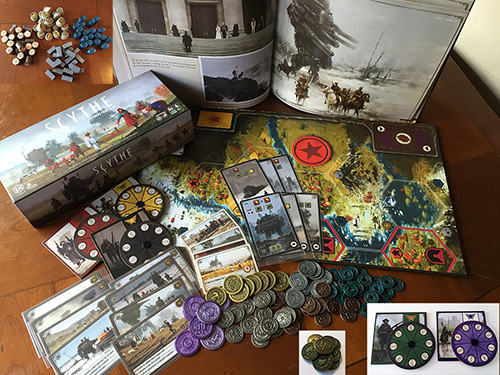 We only make one version of the core game of Scythe, and it does not include metal coins. Hi Josh. The original Kickstarter Collector’s Edition was the only version that came with coins included, so you will need to buy them seperately. Please note that some of the coins ($2, $50 and alternative colours) have always been separate items, as these were released after the Kickstarter campaign, and so these may be separate again from the main coin set. Any pics of the neoprene board? Ryan: Currently the photos are just on the Scythe Facebook group. Encounter cards 43 – 72 are in production? O__O cannot wait!! Love me some new encounters! Amazing, thanks Jamey! Looking forward to them hitting the promo shop! Wow. When can we expect to be able to order this? :) I live in EU so will probably wait if its not too far away and try and save on shipping. (interested in buying the promo coins among other things). We will play our first game of Fenris tonight! really looking forward to it! :D Thanks for an amazing game Jamey and team! I just have one question: the black tech cubes are missing one. What Can I do to have it ? (I bought the game on amazon and I am living in France). Thank you for the help !!! Love the Fenris Expansion! The whole thing is just golden! Can’t wait to get all of the modules to the table with 7 players! Where and when can I get the full upgrade kit for Rise of Fenris? I thought I saw it at gencon, but regretfully didn’t pick it up at the time. We thought about it, but because the new factions are just people with followers, not nations, it didn’t make sense thematically to give them their own currency. I was wondering if you have an estimate on when the metal mechs will be available? Anyway, I’m really enjoying the Fenris campaign! You got me curious last time we mailed. When roughly are we going to be seeing the modular map(s)? Thanks and looking forward to the new new set of Encounter cards. We have one more component planned (the modular board), but that’s it. I was wondering what size the new modular map(s) will be? Will it fit the regular board, the extended or the neoprene mat? Or will it work on all board versions? It will be the size of the regular board so that it can fit (LxW) in the box. It’s a double-sided board plus 4 double-sided tiles (clusters of 7 hexes) and some randomization tiles. It’s used completely independently of any other Scythe board. Thx for sharing this information Jamey =) The new encounter cards have been a hit in my group and I look forward to the new modular board! Is there a ETA on when we could maybe see it (in 2019?)? Q2?Q3? Oh, I have no idea at this point. :) Stay tuned to our e-newsletter! Just wondering, do you have any ETA on when we’re likely to see Rise of Fenris, the $2 and $50 coins, the new encounter cards or even just Wind Gambit will likely be added to Tabletop Simulator? I’m currently looking towards picking up the Legendary Box and the Encounter cards in the next month or two. May need to actually find players who are within 20 miles to play with but there’s always Automa in the meantime. I’ve heard that they’re getting close on The Wind Gambit. I don’t think there are plans to add those coins, and based on their current pace, Fenris is probably about a year away from being implemented. I love Scythe. Do you know when the neoprene mat will be available in Europe, especially in Spain? I can not wait for it! I asked in my favourite board game shop and they can not get any info about it. Thanks! It recently arrived for distribution in Europe, so you should start to see it in stores soon. Our localization partner in Spain, Maldito, also has it. Oh my… that was a very fast reply! Thanks for the answer! I called the shop and they are now on the lookout for the mat. I love this game on its own merits, but your dedication and attitude towards us and the game just make the game so-so much more valuable for me! Is it possible to order a set of the original wooden resources? Not the realistic resources. James: Sure, we can arrange for that. Just fill out the replacement parts form and specify that you’re looking to buy the wooden resources for Scythe. My helper will send you the price. I love your games. Quick question. Im looking to upgrade my scythe game. I have all the card promos and releases. Plus 4 automa decks. I would like wooden component upgrades for the factions and maybe the meeples please.